Australia has a massive land area and with so much space available in the land down under, it’s no wonder why many Australians choose to live in massive houses. Surprisingly, rising costs to build a new house and dense suburb population don’t seem to stop existing and prospective home buyers into living in big, luxurious homes. In fact, we’ve beaten the United States in terms of floor space per capita, with Australian homes having an average size of 214.6m2 floor area. House designs have changed over the years and this could be attributed to the fact that we now have more construction materials to choose from, improved heating and indoor plumbing systems, and material and structure durability, to name a few. The living standards have also drastically risen in the past few years, and privacy and space have become critical factors to consider when designing a house. Today, new-build homes in Victoria are bigger compared to other states with a floor space of 241m2. This is followed by Queensland at 237m2. Next in line is New South Wales with an average floor space of 227m2, which is roughly the same as Western Australia. On the other hand, ACT and Tasmania have the smallest houses at 180.8m2 and 188.1m2, respectively. See our average house size in Australia article for more details on this topic. If you’re planning to build your dream home or a property investment but can’t seem to decide on the floor plan and how big each room should be, you can use the table above and more information from the guidelines below. Is it going to be a combined family / living area? Will I have enough space to have a separate formal lounge from a regular living area? Will I be using the lounge room to entertain guests in the evening? Or will it be a regular functioning part of my home? There should be enough space to move around and to fit in a number of furniture, so the ideal dimension is usually 5.2m x 5.0m. With enough floor area to work with, you can rearrange your furniture every now and then to give your home a ‘new’ look. 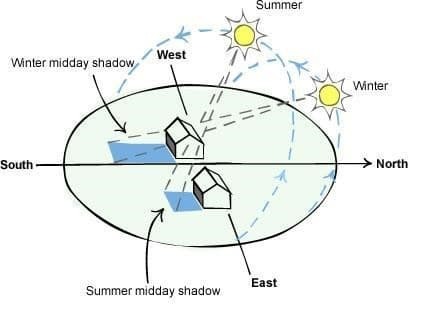 We also know that Australia can be really hot and dry during summer, so you may want to consider cross flow ventilation and your house orientation for the best energy efficiency. The windows should placed strategically to allow a cold summer breeze to enter the house and large window openings should be on the North side to allow heat in winter due to the sun angle. The bedroom is your own personal space in your home where you can relax, get a breather, and have a good night sleep after a stressful day. Today, master bedrooms are now big enough to fit in a spacious walk in closet and an ensuite for added comfort and privacy. Technically, the space required should just be enough to fit in a double bed, one or two side tables, and maybe a little bit of extra space for a mirrored dresser and a built-in or free-standing wardrobe. An average master bedroom size is around 4.2m x 3.9m, which should be enough to accommodate these and in still allow you to fit in a king size bed if you want to. In terms of location, you can build the master bedroom separately from the other rooms or situate it with the other bedrooms in the designated sleeping zone. You may also want to consider the location to be on the southern side since this is the colder part of the house, and so you won’t take up the bright and warm space more suited for habitable rooms such as the lounge or family room during daytime. More often than not, the general bedrooms are the ones compromised in terms of size when budget restrains call for it. 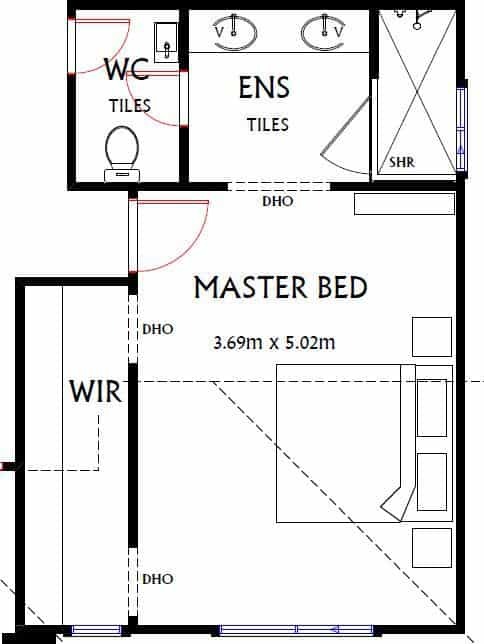 The average bedroom dimension in most Australian homes is around 3.0m x 3.0m, and this gives enough space to comfortably fit in a double bed, a single or double door wardrobe, and a study desk or drawers. If you’re planning to build more than 2 bedrooms (including the master bedroom), the decision on size and configuration of the rest all comes down to how you want to use the rooms now or in the near future. If it’s just going to be a spare room if you have guests over for the holidays, you can settle with a 2.7m x 3.0m floor space. If it’s just a for a study room, office, or arts and crafts room, you can even settle with less than the minimum. However, kids are spending more time in their rooms than ever due to computer games and having sleep overs. So, you may want account for the size of common roll away mattresses or computer desks to be sure the room is big enough. Many homeowners say that the kitchen is their favourite part of the house. Why wouldn’t it be when it’s the place in your home where they can experiment and whip up delicious creations for the whole family to enjoy? When designing your kitchen layout, keep in mind that you have to minimise the travel distance between the three most integral part of your kitchen: sink, stove, and fridge. 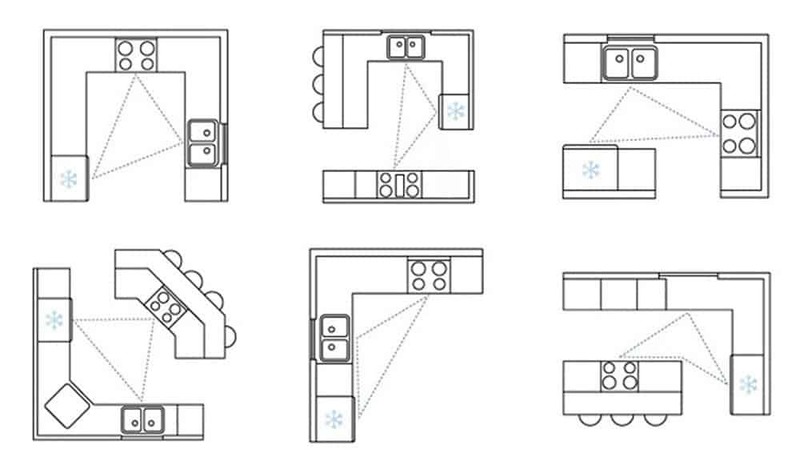 If you look at the illustrations below, each configuration gives enough space fit in all your kitchen essentials with enough space to move around. Keep in mind, though, to keep each leg between 1.2m to 2.7m so that there is a good balance between the walking distance and you won’t feel too cramped and lacking in working space. The most strategic location for bathrooms in many Australian homes, especially those in the temperate regions, will be in the southern part of the house. This is so you can locate the habitable rooms like lounge, rooms, and family areas in the northern side for that cool breeze you want during summer, and warmth during cold winter mornings. The design and floor space of your bathroom should be enough to fit in a shower cubicle (usually 900 x 900mm), toilet, and a basin. 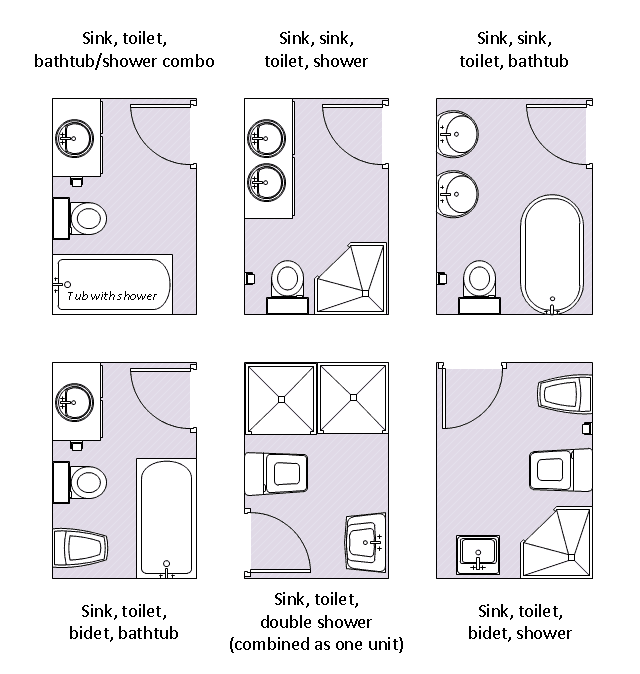 Smaller bathrooms are usually 1.5m x 2m, but you can go as big as 3.2 x 2.5m, budget and space permitting. If you’re one of the lucky ones with enough space for a spa tub or bigger vanity units, best decision is to go for it because it’s going to be useful when you just have to wind down and relax after a hectic work week. The average size of a double garage is about 6m x 6m. This will fit two cars in this space with the ability to easily open the doors and not worry about hitting the wall. The size of your car does have an effect on how small you can make your garage. In addition, as mentioned in our garage size article, the Australian Standards state that a double garage can be no smaller than 5.4 x 5.4m. Nice article – lots of useful information for someone in the first stages of planning.